An experimental effort to search for particle dark matter, the Chicagoland Observatory for Underground Particle Physics debuted in 2004. A prototype bubble chamber sensitive to Weakly Interacting Massive Particles (WIMPs) was installed in the MINOS near detector gallery at Fermilab (FNAL). 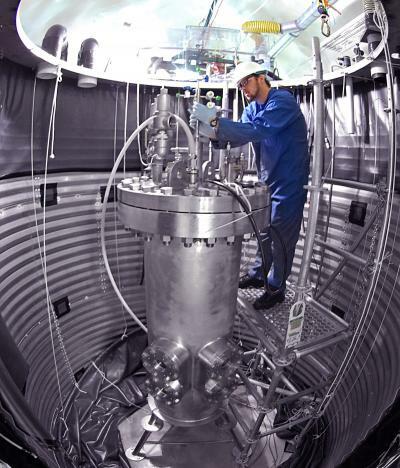 The chamber contained two kg of CF3I, a fire-extinguishing liquid that can be superheated to respond to very low energy nuclear recoils like those expected from WIMPs while being totally insensitive to minimum ionizing particles, the dominant background in this type of searches. The COUPP collaboration presently runs a 4 kg chamber in the Canadian SNOlab underground site, a recently commissioned 60 kg chamber, and is designing a 500 kg device. The COUPP and Picasso collaborations have merged their efforts and become the PICO collaboration. Dark Matter, Discovery Channel's "Daily Planet"
PhD Thesis Defense, Alan Robinson, "Dark Matter Limits from a 2L C3F8 Filled Bubble Chamber"
KICP Talk, EFI Colloquium: Eric Dahl, "The COUPP Dark Matter Search- Results from the First Year of Deep Underground Running at SNOLAB"
PhD Thesis Defense, Matthew Szydagis, "Dark Matter Limits from a 15 kg Windowless Bubble Chamber"
KICP Lecture, SAIC Lecture: Juan Collar, "Searching for Dark Matter in the Sewers of Chicago"
KICP Talk, Cafe Scientifique: Juan Collar, "Searching for Cosmic Dark Matter in the Sewers of Chicago"